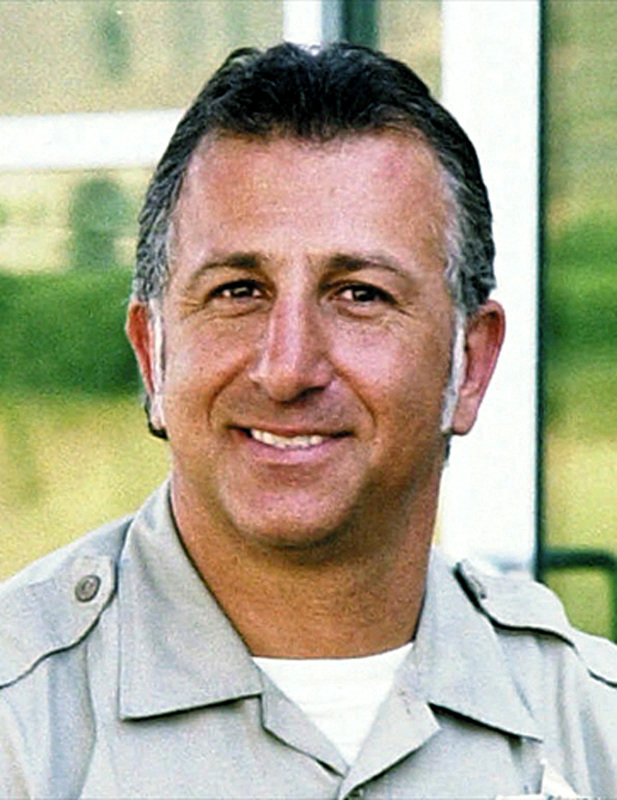 SCVHistory.com | Law Enforcement | Remembering SCV Sheriff's Deputy Hagop 'Jake' Kuredjian, E.O.W. 8-31-2001. A smiling deputy eager to lend a helping hand. A friend who enjoyed motorcycles and dropped in to the local smoke shop for a good cigar, chatting up reporters in the newspaper office next door. A giving public servant. A dependable partner. A son. A brother. A fiancé. When he rolled up to a barricaded suspect scene on that fateful day — Aug. 31, 2001 — Deputy Hagop "Jake" Kuredjian knew only one thing — that his fellow deputies needed help and he was there to see what he could do. Responding to the Brooks Circle address in Stevenson Ranch where federal and local officials were met by firepower when they tried to serve a search warrant, he tried to take shelter behind a parked car, but one shot from a second story window hit him in the head and he fell, just yards from the other officers. They couldn't get to him in time. Our community lost Jake that morning. Four thousand people attended his funeral at St. Mary's Armenian Apostolic Church; uniforms lined the path to his final resting place at Forest Lawn, Hollywood Hills. There is a street named after him in Newhall and a park in Stevenson Ranch. Seventeen rose bushes — one for every year of his service to the Sheriff's Department — were planted in a memorial garden that honors him and another officer killed in the line of duty, Deputy Arthur Pelino. His killer, James Allen Beck, who was wanted on suspicion of stockpiling weapons and impersonating a U.S. marshal, died when tear gas canisters ignited, creating a firestorm and destroying the house in the normally quiet neighborhood. The lot was eventually cleared and a new house built on the site. There are other 10-year commemorations on the minds of many local residents, who will soon observe the first decade since the 9/11 terrorist attacks on America. But to the law enforcement community, this anniversary also has special meaning. On Wednesday morning, at 10 a.m., there will be a gathering to honor Jake Kuredjian at the corner of Poe Parkway and Stevenson Ranch Parkway, where a monument that bears his beaming likeness was placed by a grateful community. The public is invited to participate; some traffic lanes near the corner of Poe and Stevenson Ranch will be closed to accommodate the crowd. Organizers picked the midmorning time so as not to interfere with school traffic and have plans to be out of the area before the school lunch rush. His mother, Anahid, and brother Garo will be there, and Sheriff Lee Baca and Los Angeles County Supervisor Michael Antonovich will speak. Baca delivered an emotional tribute that is preserved on the SCV Sheriff's website and reprinted here. "On Friday, August 31, 2001, the sunshine seemed to dim, laughter faded away and there was a little less joy in the world because Deputy Hagop ‘Jake' Kuredjian was taken from us. A deranged man wielding a rifle took his life, in a brief moment of time, leaving his family and an army of friends to mourn his loss. "In the short time since his tragic death at 40 years old, I have been overwhelmed by the stories of how much life Jake packed into the relatively short time he was with us. If friends were counted as income, Jake was one of the richest men in the world! While we can't help but grieve his passing, I am determined to remember that million dollar smile and the fact he would give the shirt off his back to help a family member, friend or stranger. "Let us remember Jake enjoying a good prank, telling a joke or riding down the road on his Harley. Please never forget that Jake willingly put his life at risk to come to the aid of residents and law enforcement personnel who were in peril. Most of all, if you have not already done so, thank God for sharing Jake with us, even if just for a little while." The speakers will talk about Kuredjian's sacrifice and his dedication and service to the community he had grown to embrace. Those in attendance will have their own memories of Jake. "Jake and I were very close," said Lt. Robert Lewis, who is organizing the event. "We worked together in Malibu and we were good friends." During his time at the Malibu station, Kuredjian received the Gold Meritorious Conduct Award for rescuing a woman who was stranded on a cliff. "As a law enforcement officer, Jake gave great service to the community and his fellow officers," Lewis said. "There was never one day when he wasn't willing to step up and help citizens or fellow deputies; if someone locked their keys in the car or a deputy needed help finishing reports, he'd always say ‘no problem' and stay to help." "He had a great heart," he continued. "He loved the community and the department." Some procedures have changed since Jake's death, after department officials dissected the crime scene and the actions of the persons involved. Interagency relations have improved and officers employ more cautious tactics in responding to hazardous situations. Maybe Jake is still looking out for his fellow deputies.